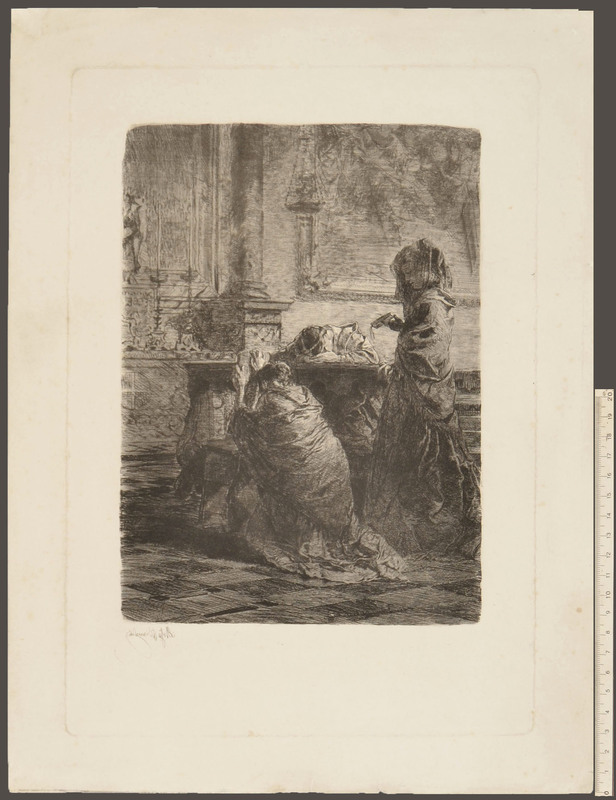 Etching, Mezzetti 70. A fine impression of the first state of two, before the letters of the edition for L'Arte in Italia. Printed in black ink on white wove. Large margins, minimal faults at margins, otherwise in very good condition. To the platemark 335 x 233 mm, the entire sheet measuring 397 x 297 mm. After the painting by Bianchi (1867) at the Galleria Civica d'Arte Moderna, Milan. See: Lamberto Vitali, Incisioni Lombarde del Secondo Ottocento all'Ambrosiana, Milan, 1970; no. 34 , illustrated. 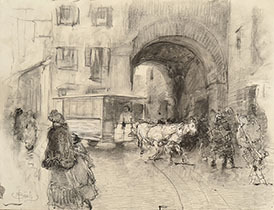 Mosè Bianchi enrolled at the Accademia di Belle Arti at the Brera, Milan, in 1856. In 1859 he temporarily abandoned his studies to fight in the second Italian War of Independence, returning to Milan to study under Giuseppe Bertini. 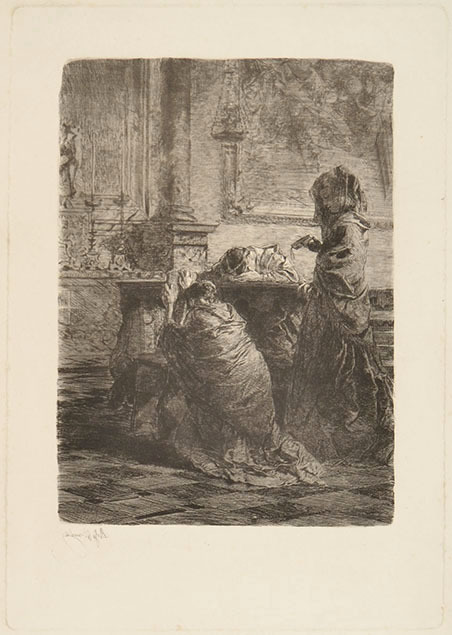 Among his fellow students was Tranquillo Cremona, whose involvement with the Scapigliati later had an impact on Bianchi’s work. In 1862 Bianchi exhibited his first large-scale independently painting. He continued to exhibit regularly and in 1866 he was awarded the Pensionato Oggioni, which enabled him to visit Venice, Paris and Rome. 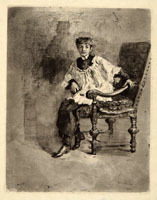 During this period Bianchi met the artists Mariano Fortuny y Marsal and Ernest Meissonier, and the dealer Goupil, who inspired him to produce a series of 18th-century genre scenes. Eighteenth-century influences, especially the work of Giovanni Battista Tiepolo, were also important for his many fresco cycles. Bianchi continued to attract attention with his views of Chioggia and Milan, these frequently providing the background for genre scenes. He was also a sensitive portraitist and made etchings. Notwithstanding his intense activity and continued public success, Bianchi spent his final years in poverty, assisted by his nephew, the painter Pompeo Mariani.